A recent Walter J. Fuller poses for the camera near his home in Westminster before shipping off for training in 1917. The photo was originally part of a much larger scrapbook which was broken up and sold on eBay in 2012. Luckily they included a bit of context to the sale listing, enabling me to track down the identity of this brave Vermonter. 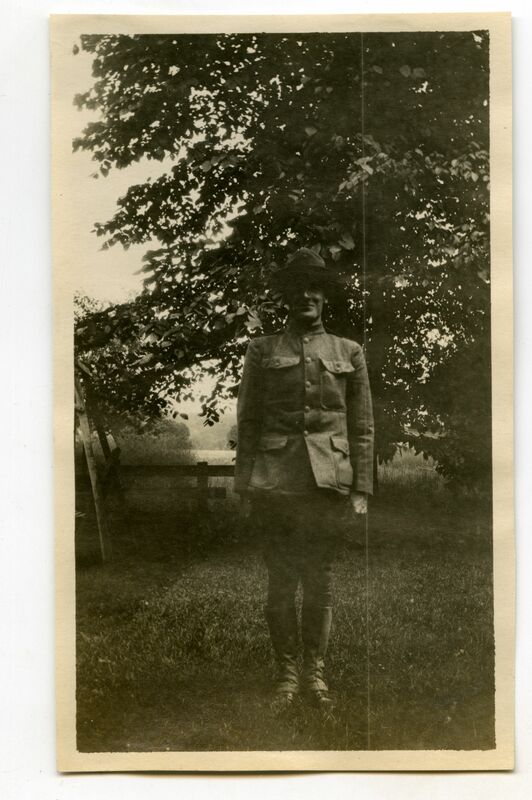 A member of the 103rd MG Bn., Walter shipped out from Fort Ethan Allen down to Camp Bartlett in Massachusetts. It was here that he contracted the bronchial pneumonia and passed away at 3:30 (yes, we know the exact time!) on October 27th, 1917. His family was contacted via telephone about his worsening condition and were able to be present when he passed away. Johnson, Herbert T. Roster of Vermont Men and Women in the Military and Naval Service of the United States and Allies in the World War, 1917-1919. Montpelier, VT: Tuttle, 1927. 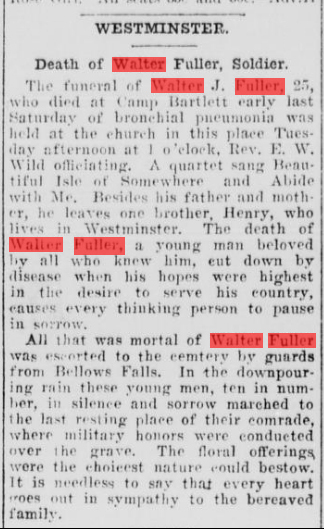 “Soldier Dies in Westfield.” Vermont Phoenix, November 2, 1917, 2. Accessed December 4, 2013. ChroniclingAmerica.loc.gov. He died of disease in 1917 while the 26th Yankee Division was still in formation at Westfield, not in 1918. The article in the Phoenix is also from 1917. This is significant because he died before having the chance to even be shipped to France with the first complete American Division to arrive overseas. Thanks! I wrote that post late one night and mixed up the date. Appreciate the comments.